Ajax take on Real Madrid in the second leg of their Champions League last-16 tie on Tuesday night, and Barcelona had a message for summer signing Frenkie de Jong. The Dutch giants face a 2-1 deficit from the first meeting as they have it all to do at the Bernabeu this week in order to advance to the quarter-finals. Nevertheless, they did cause the current European champions problems in the first leg, and so they’ll go to the Spanish capital hopeful that they can cause a shock. As noted by BBC Sport, Barcelona have already wrapped up the signing of De Jong from Ajax for this summer for a whopping €75m+ and the Dutch starlet has revealed that his future employers had a cheeky message for him when he signed his contract. 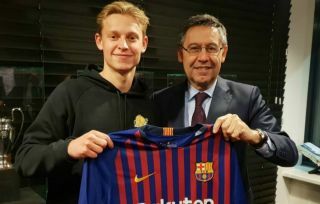 The draw for the last-16 would have been known by then and De Jong has revealed Barca officials made a request to him. “Barça asked me when they signed me to eliminate Real Madrid ,” he is quoted as telling De Telegraaf, by Mundo Deportivo. The 21-year-old has been an ever-present for Ajax this season, scoring four goals and providing two assists in 36 appearances in all competitions. Regardless of where his future loyalties lie, he will be a fundamental figure for the Eredivisie outfit this week if they are to advance to the quarter-finals, while he will seemingly also become increasingly popular with those at Barcelona if he can make their request come true. Barcelona have work to do in their own tie too, having been held to a goalless draw by Lyon in their first leg last month.